Sally Stone has been transgender since she was a child. Freely expressing her feminine persona, she experiences the world from a unique perspective. She actually considers herself to be gender fluid, embracing both her male and female genders equally. She brings with her a varied set of trans perspectives as she is a retired military veteran, the father of two, and happily married to a loving and supporting wife. Sally is a long-time advocate always doing what she can to further transgender causes. 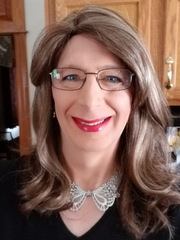 She held office in the local Atlanta chapter of TRI-ESS for several years, has been involved in numerous TG outreach programs, and she has been published numerous times by transgender periodicals and online blogs. Sally has attended every Keystone Conference since its inception, and over the years she has been a regular Keystone presenter and volunteer.